38" wide, 17" deep, and 18 high at the back rest. Made of 20 gauge metal. Reinforcing steel rod is spot welded around the top edge to give the seat strength and stability. Angle brackets are welded at the lower corners to add extra strenght to this lower area. In the center of the seat a metal support is attached for additional strenght and stability in this area of the seat. 3/4 waterproof billboard sign plywood is used for the seat base. 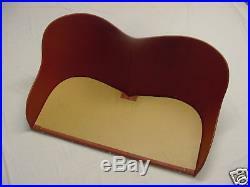 Metal cushion angle strip is placed at the bottom edge of the base to hold the seat cushion in place. Red prime coat is added to the seat metal. The item "Model T Ford speedster torpedo style seat" is in sale since Monday, November 10, 2014. This item is in the category "eBay Motors\Parts & Accessories\Vintage Car & Truck Parts\Suspension & Steering". The seller is "bill7472" and is located in La Habra, California. This item can be shipped to United States, Canada, Bahamas, Viet nam.